Acupuncture is part of a complex, integrated healing system and is used in the treatment of a variety of conditions including pain relief, muscular-skeletal injury, diseases of the eyes, nerves, muscles, heart, and the organs of digestion and reproduction. Acupuncture involves inserting fine needles into specific points on the body. In Chinese medicine, it is thought that energy flows through meridians or channels in the body. These channels connect the body’s structures to the Zang Fu Organs, with a free flow of energy being necessary for optimal health. Specific acupuncture points relate to precise locations along the channel, with each serving a different purpose in the treatment of disease (known as “patterns of disharmony” in traditional Chinese medicine). 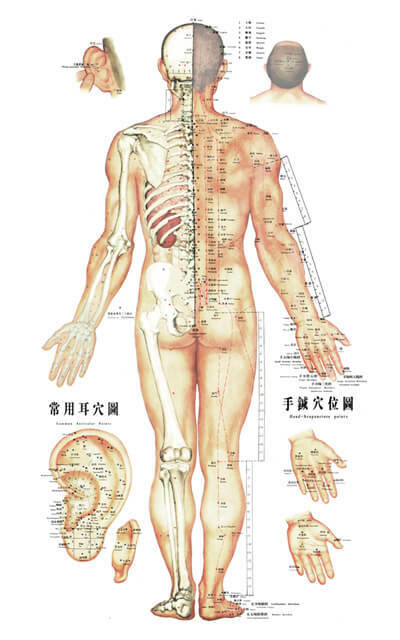 All in all there are over 360 ‘classical’ acupuncture points on the channels. Parts of the body, in particular the hand, the foot, and the ear, have additional systems of points that can be utilised as well. Correct diagnosis of the patient’s condition is imperative in influencing the correct choice of therapeutic acupuncture points. At MEDICUS the most current ‘state of the art’ technological advances are implemented in diagnosis. Traditional methodology is elegantly blended with Science in the use of Electronic Pulse Diagnostic equipment. The effects of the treatment not only depend on the function of the points, but also on needling depth and technique. Various needling techniques and depths are recommended to provide different outcomes. Electrical stimulation may also be applied to the needle. There are more ways to affect the acupuncture points than needles, with the particular technique chosen by your practitioner depending on your symptoms and the overall Pattern of Disharmony. For example, a herb called moxa may be burned over the acupuncture point to create heat. In effect this is a gentle yet subtle thermal stimulation of the acupuncture point. Amongst the preferred techniques in the administration of acupuncture treatment at MEDICUS is the use of the Infrared Clinical Laser beam. This method is safe, efficient, scientific, and precise in its administration because the strength and duration of a treatment is specific and controlled. The other important advantage of using an Infrared Laser is that it is totally painless. An important issue when treating children and/or those fearful of needles. At MEDICUS we are experienced in the use of Mesotherapy, Bio-Mesotherapy and Biopuncture. The therapy consists of the use of injectables. The saline solution is injected on acupuncture points, specific trigger points or even into and around joints. Generally the blood supply to tendons and ligaments is poor, and healing after injury is incomplete. Incomplete healing results in previously strong connective tissue becoming relaxed and weakened. This, in turn, leads to a tendency to repeat injuries occurring in the same weakened area. The relaxed ligament or tendon becomes the source of chronic pain especially at the point where it is attached to the bone. This technique by its very nature, assists the body’s natural healing processes, and is most useful in the regulation of acute and chronic muscular-skeletal conditions ranging from sprain and strain, to osteoarthritis. Sessions are for approximately half an hour. Depending on the severity of the condition, treatment is often twice weekly for the first two weeks and as the healing process is facilitated and the condition is ameliorated, treatments become weekly, fortnightly or monthly. Some conditions may require maintenance treatments to ensure that wellness is supported. It is not necessary to have anyone drive you to or from your appointment, and you may resume your normal daily activities immediately after your leave the office.